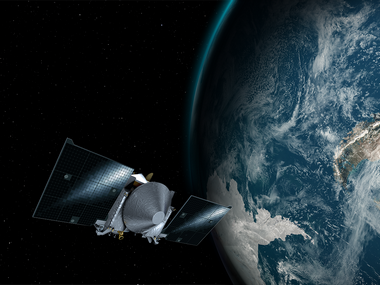 The Earth's gravity will fling the OSIRIS-REx spacecraft, travelling at a staggering speed of 19,000 miles (30,758 km) per hour. NASA's asteriod hunting OSIRIS-REx spacecraft is all set to make a close flyby of Earth on Friday, before reaching asteroid Bennu, media has reported. The Earth's gravity will fling the OSIRIS-REx spacecraft, travelling at a staggering speed of 19,000 miles (30,758 km) per hour, upward by about six degrees so that its trajectory will match the tilt of the orbit of asteroid Bennu, nytimes.com reported on 21 September. OSIRIS-REx (Origins, Spectral Interpretation, Resource Identification, Security, Regolith Explorer) was launched atop a United Launch Alliance Atlas V 411 rocket on September 8, 2016 to study samples from the asteroid Bennu — a type B carbonaceous asteroid with an approximate diameter of about 1,614 feet (492 meters). On 22 September, the spacecraft will approach and retreat from its closest position over Earth, approximately 11,000 miles (17,000 km) above the planet's surface, swinging it over Australia before making its closest approach over Antarctica near Cape Horn, Chile. "The opportunity to capture images of the OSIRIS-REx spacecraft as it approaches Earth provides a unique challenge for observers to hone their skills during this historic flyby," Dante Lauretta, OSIRIS-REx principal investigator at the University of Arizona, Tucson, NASA said in a statement earlier this month. "We're essentially stealing a bit of the Earth's momentum as we go by," said Michael Moreau, who leads Osiris-Rex's navigation team at NASA's Goddard Space Flight Center in Greenbelt. The spacecraft is scheduled to arrive at its destination of Bennu in 2018, where it will collect and return samples that experts believe may hold the building blocks of life.